Studio Osmosis’ design of a residence in The World Towers, Mumbai, leaves behind its signature stamp of luxury blended with a homely ambience. 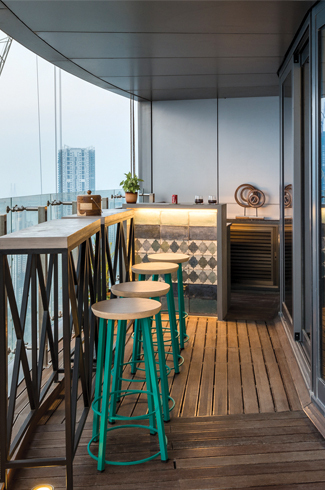 Sitting on the majestic 48th floor, the apartment offers a toast to both the Mumbai skyline and the Bandra-Worli sea link. 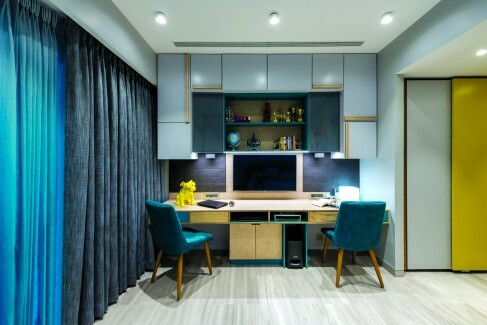 The design elements in the living and dining rooms, be it the radial lines on the ceiling or the quirky shaped dining table, accentuate the curved shape of the apartment. Breaking away from the hurried rhythm of Lower Parel, Mumbai, a quiet sanctuary in The World Towers welcomes one into a cosy cocoon of its own. 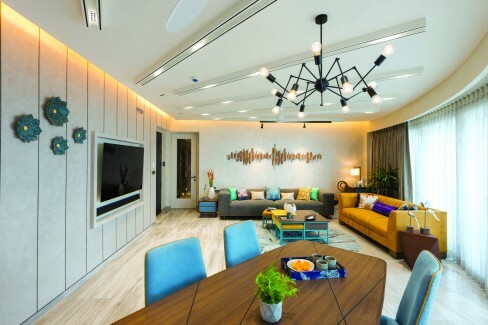 While the residence, designed by Studio Osmosis, owns the unmistakeable stamp of luxury and style, it also surrenders to the surrounding nature and stays true to its fundamental purpose of serving as a home to its residents: a three-generation family. Designed, in collaboration with Kalaakari Haath, this custom-designed wall graphic uses techniques such as satire, humour and off-scaling to portray an ironical take on the concept of urban living. 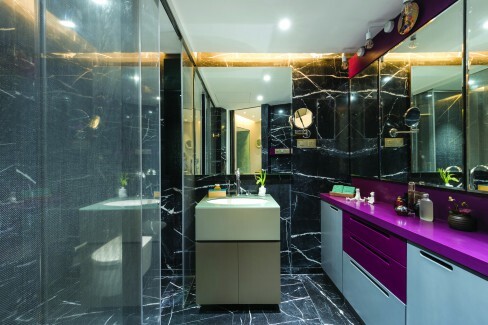 Shilpa Jain Balvally, Principal Architect, Studio Osmosis, says,” Despite being part of the luxurious Armani-designed World One project, the client wanted to leave the five star hotel-like luxuries behind when you enter home. The client wanted the design to radiate the warmth and comfort that a home provides and also have some feel-good spaces.” A simple, uncluttered design and a subtle colour theme interspersed with cheery art pieces that pay reverence to the Mumbai culture worked successfully to achieve a personalised, homey feel. The child’s bedroom has a fresh colour palette composed of yellow, ochre, teal and light grey; the study storage here, detailed with light coloured grids is highlighted by birch ply handles. The building’s curved design posed a challenge but also created an exciting premise for Sameer and Shilpa Balvally, and their team. In the living room, various design elements highlight this curved façade. The orientation of the furniture is inward facing towards the television, but the radial lines on the ceiling are a tribute to the non-linear shape. “The radial lines on the ceiling and the subsequent lighting design, serve to frame the outside view. These lines flow from the ceiling to the walls in a way that subtly pulls one’s attention to the windows and what lies beyond them,” says Balvally. Various shades of blue, inspired by the beach and the skyline, render the home a serene vacation-like vibe, while also providing a seamless transition from one room to the other. Throughout, the background is kept neutral with mushroom shades only to be contrasted by colourful furniture pieces. In the living room, custom-designed steel-grey and mustard highlighter sofas enclose a centre table; these have been fabricated with colour highlights and space grids to help tuck in poufs. A circular rug with radial lines holds this odd-shaped seating area together. The quirky shaped table in the dining area, tapering slightly towards one side, blends in perfectly with the curved wall. Warm shades of greys and concrete, rough textures from Asian paints with pops of colour and antique metal highlights form the colour palette here. “We wanted to maintain a delicate balance between using accent colours and not making the space feel too quirky,” shares Balvally. Each bedroom in this apartment has its own unique sensibilities, given that it caters to a different generation. The parents’ room has a neutral earthy tone balanced by the fluted leather headboard. 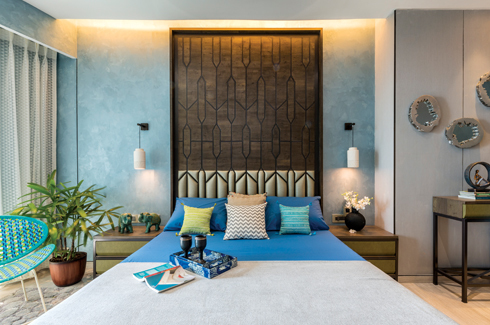 Soothing shades such as pastel rich grey-blues, greys with jute and white sheers adorn the master bedroom. The room embodies elegance with textured paints and concrete elements paired with antique metal geometric motifs. These motifs continue in metal and veneer against the back wall of the English green leather bed. The child’s bedroom has a fresh colour palette composed of yellow, ochre, teal and light grey; the study storage here, detailed with light coloured grids is highlighted by birch ply handles. Art has a special place in this Mumbai apartment. 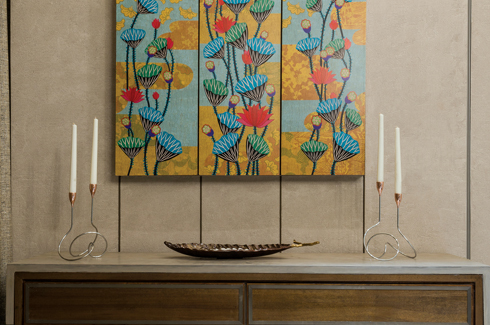 The metal abstract wall art, custom-made with a local artist in Jodhpur, along with the temple cabinet neatly concealed behind a floral graphic artwork brighten up the living room. Designed by LivinArt, the cabinet is a curious mix of the traditional and the modern. Personalisation and collaboration are two key themes in the project – custom-made art works, furniture and accessories done hand-in-hand with various artists and artisans contributed to the creation of an envious design. The long passage from the living to the master bedroom serves as a topic of conversation with guests because of the brilliantly designed wall graphics. Designed in collaboration with Kalaakari Haath, it is a satirical take on the concept of urban living. 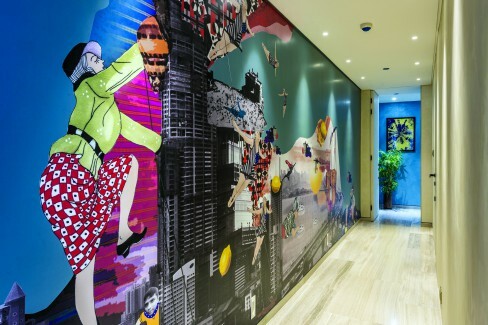 It also displays caricatures of the kids to add humour and personality to the space. For any onlooker, this apartment would be all about balance – mesmerising sea views that provoke introspection successfully balance the rooted subtlety of the interiors and humorous, modern art works balance the breath-taking luxury; additionally all the serenity inside competently balances the chaos of the city outside.